It sure is interesting the Washington Post got this anonymous "scoop." He picked New York and Virginia over Nashville because they're two major centers of political power. 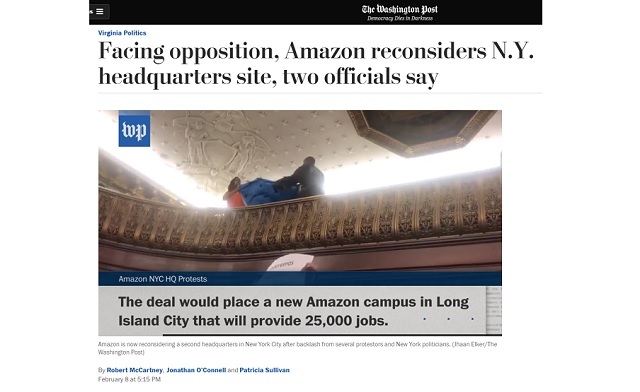 The Post added that no specific plans to abandon New York have been made and it's possible Amazon could use them as a threat to pressure New York lawmakers. "[C]ould use them as a threat..."
This article is Bezos using them as a threat. The so-called "institution" that is the Washington Post is now nothing more than a propaganda organ for the world's richest man working to help him get better deals and pressure state governments to quash his opposition.